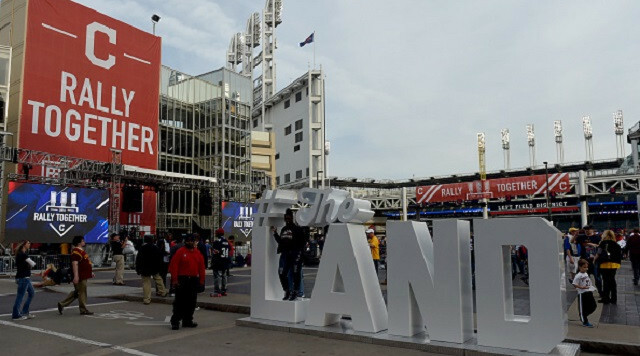 The good times are rolling in Cleveland for the local sports scene (pay no attention to the Browns), and Major League Baseball is hoping that will still be the case two years from now. That is because the MLB All-Star Game is being slated to return to Cleveland for the first time since 1997 for the 2019 midsummer classic. According to Cleveland.com’s Zack Meisel, the Indians are expected to announce the news Friday morning during a press conference. The All-Star Game will be played for a second time at Progressive Field, which has just been remodeled and is widely regarded as one of the top ballparks in baseball. This decision will not be received well by some fanbases of course, as the game goes back to Cleveland for the second time since 1997 before ever taking one trip to a small handful of other venues. The practice of alternating between American League and National League stadiums was abandoned in recent years, with a National League team hosting the game for four straight years from 2015 (Cincinnati) to 2018 (Washington). Getting the game back in an AL park may have carried some weight for the 2019 season, but going back to Cleveland just four years after being played in Ohio? Take that, Oakland and Tampa Bay! The last time the Oakland Athletics hosted the All-Star Game was in 1987. The Tampa Bay Rays have never hosted the All-Star Game. It is not a coincidence, perhaps, that both of those franchises are in the midst of ongoing battles for long-term stability with their respective stadium options. But what about other cities with stadiums just waiting to be shown off to the baseball world in the middle of the summer? The Philadelphia Phillies last hosted the MLB All-Star Game in 1996 at old, decrepit Veterans Stadium, one year prior to the last All-Star Game in Cleveland. The Phillies have since moved into Citizens Bank Park, a ballpark just itching to host a Home Run Derby and All-Star Game. The Red Sox have also gone a little while since hosting an All-Star Game, although it was played at Fenway Park two years after Cleveland’s last hosting gig (1999). Or what about Baltimore? Camden Yards kick-started MLB’s new ballpark renaissance when it opened in 1992, yet has not hosted the game since 1993. The game returning to Washington D.C. probably leaves Baltimore on a waiting list for a few more years, however. Anaheim hosted the All-Star Game in 2010, but the Los Angeles Dodgers have not hosted an all-star game since 1980. 1980! When is the game going to return to Dodger Stadium? But congratulations to Cleveland. There is nothing wrong with seeing the game played in Progressive Field. Did you know the Indians will have hosted more All-Star Games than any other MLB franchise? (The 2019 game will be the sixth in Cleveland.) How about making more of an effort to spread that All-Star Game around a bit more, MLB?